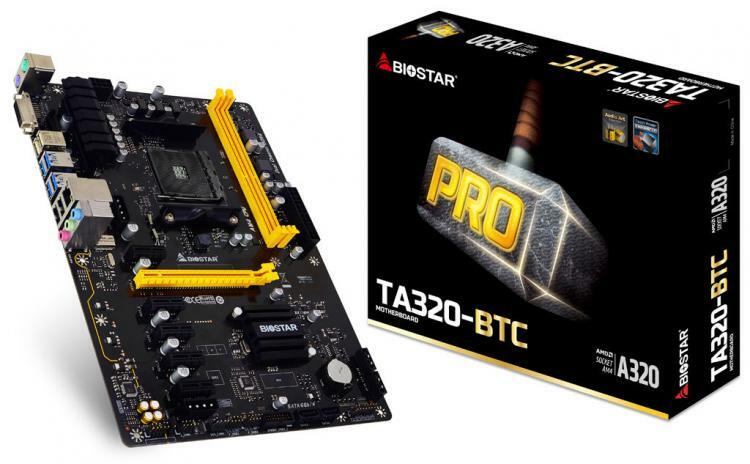 BIOSTAR releases an AM4 socket-based Cryptocurrency mining-oriented motherboard – the BIOSTAR TA320-BTC motherboard. The TA320-BTC offers great price performance ratio with its low-entry price point with AMD Ryzen processors and the AMD A320 chipset. The motherboard offers up to 6 PCIe slots for mining cards. 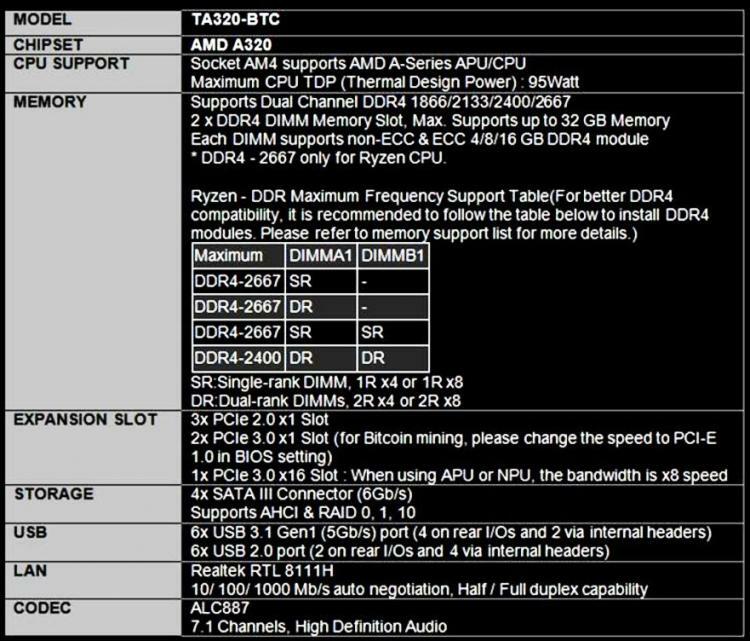 The TA320-BTC support the AMD Ryzen 3, 5 and 7 desktop processors along with the upcoming 7th-generation Athlon processors that offer great performance for its value. The motherboard supports up to 32GB of DDR4-2667MHz memory in dual-channel configuration packing up high performance memory. The motherboard has one full 16X PCIe 3.0 slot and five other 1X PCIe slots giving a total of 6 GPU mining slots. The motherboard also has two Auxiliary Power Connectors to support powering up the GPUs thus providing greater stability. The BIOSTAR TA320-BTC also uses 100% solid capacitors for high-endurance that 24/7 mining operations require. It also packs several protection mechanisms such as the BIOSTAR exclusive Super LAN Surge Protection technology, ESD Protection, Overvoltage protection and Iron Heart Protection which protects the motherboard from heavy CPU coolers. 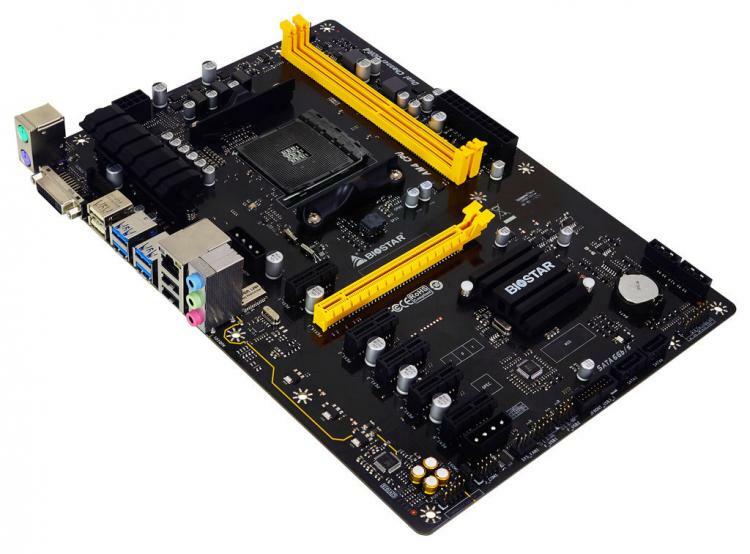 For more information on the BIOSTAR TA320-BTC AM4 Mining Motherboard, visit the BIOSTAR website.